"Looker is a complete data platform that offers data analytics, exploration and insights to every function of a business." Looker scored 89/100 in the Business Intelligence (BI) category. This is based on user satisfaction (87/100), press buzz (51/100), recent user trends (rising), and other relevant information on Looker gathered from around the web. Regional Restrictions: Only currently available in English. Looker is a web-based business intelligence (BI) software solution designed for medium to large businesses that wish to take full advantage of the expertise of their data analytics team. The platform is primarily geared towards data exploration and analytics. It is capable of helping businesses capture and analyze data collected from different sources so they can make data-driven business decisions. Looker offers a web-based interface that analytics teams and business intelligence professionals can utilize to make the core processes of data-discovery, collection, and analysis a lot more efficient. Looker is a cloud-based business intelligence platform that provides an intuitive approach to data exploration and analysis. The solution provides a robust interface for businesses and analytics teams to utilize, affording the ability to properly evaluate various elements relevant to their business. This includes analyzing supply chains, interpreting customer behavior, quantifying customer value, evaluating distribution processes, and marketing digitally. The software solution has a “view source” function, which enables users to easily identify and understand how the data they’re collecting and consuming is being manipulated. Customizable graphs, charts, and reports are available for teams to use when presenting data and insights through the Looker dashboards. Moreover, all dashboards can be further delved into for more comprehensive queries, as well as to discover valuable data in multiple layers. Looker’s data-modeling language provides users with the ability to accurately define various data metrics and explore relationships among different data sets. The storytelling feature, which comes built-in with the cloud-based BI platform, makes it possible to present data analysis to stakeholders and decision makers via comprehensible and data-rich visualizations. Looker has been clearly designed in such a manner that you are able to create and share reports quickly and without difficulty. This means other teams in your organization have the ability to share their reports and analysis on the fly, making the flow of information within your company more efficient. When used to its full potential, Looker has the power to help businesses handle their data more effectively in order to promote an information-driven decision-making process. By utilizing a versatile and user-friendly language known as LookML, your in-house data experts and analysts will have the ability to develop minor applications that only add to the effectiveness of your data exploration efforts. The LookML syntax is designed to help simplify the developmental processes of robust models for any company, while also making sure to improve the capabilities of SQL. 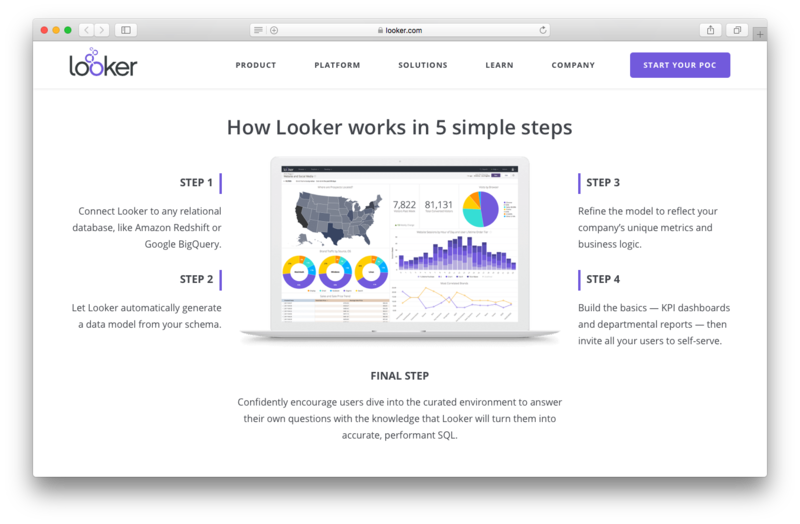 Looker helps to minimize the time and resources spent coding queries on an ad hoc basis and setting up advanced BI solutions, or to eliminate such time-consuming processes altogether. Looker is a data-discovery platform that facilitates the decision-making process for businesses by providing access to real-time intelligence. Regardless of the size of the data being collected and analyzed, the process can be done within Looker’s built-in database and browser-based platform. 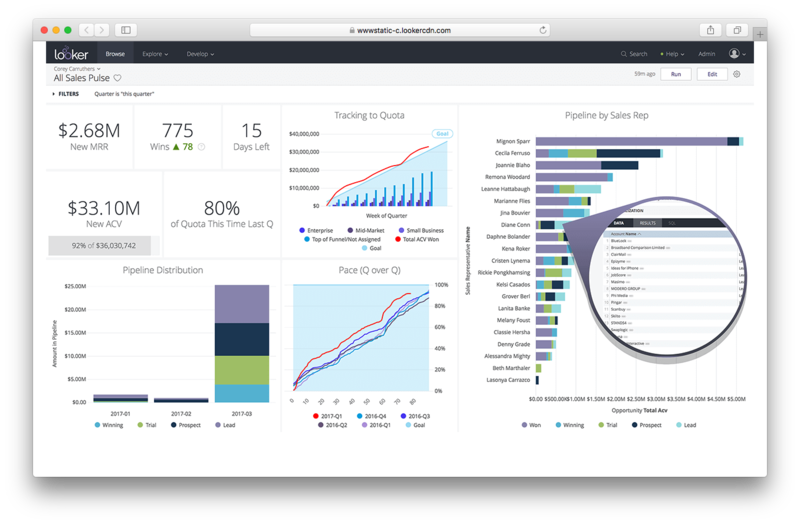 Looker Analytics seamlessly integrates with any SQL database or data warehouse solutions like Amazon Redshift and Greenplum. Looker BI software solution is designed for optimum functionality and usability. The web-based platform effectively addresses the needs of medium to large business enterprises and even small startups in certain cases. The following are a few key reasons why Looker is worth considering when you’re looking for a good business intelligence software solution. When using Looker, your team of data analysts is able to use a flexible and easy-to-learn language known as LookML in order to design and create small applications to complement the data exploration process and make it more efficient and powerful. The syntax of LookML language helps to simplify the development of robust models for essentially any organization as well as enhance the capabilities of SQL. Looker’s language-based approach allows for faster execution of queries and performance optimization. Looker has a clean and easy to understand layout, allowing for a much smoother data exploration and acquisition process. All core functions pertaining to data exploration are located on the left-hand side menu, including the settings. This means everything you need, every activity or function, is collected in a single location for ease-of-use and efficiency. For the design and creation process of visualizations, you have a special data scheme where you simply utilize the drag-and-drop function to add or remove specific elements, as well as assign key roles like Administrators, Developers, and Users. A unique mapping tool is also on hand for less knowledgeable or inexperienced users to help them prepare rather advanced and technical visualizations. One of the main selling points of Looker, as a web-based BI software solution, is ease of use. The platform is designed to be as user-friendly as possible. Your data analysts don’t have to be extremely knowledgeable or have extensive experience with SQL or any other programming language to effectively manage workflows, especially since most operations in the platform essentially boils down to a singular, highly intuitive code. Using Looker BI software solution doesn’t involve complex coding. And getting into the data across interactive charts and tables is relatively simple. Moreover, the web-based platform comes with self-service features like creation of dashboards and visualizations, filtering, and pivoting. The feature-rich platform allows for seamless collaboration among users, which is especially beneficial for companies employing a team of data analysts and professionals. The collaboration features are easily accessible on any browser or mobile device. This means every team member may contribute and get notified of any changes or progress to the project anywhere and anytime. Aside from a feature-rich platform and a self-service database, Looker also offers a tech support team. You can ask for assistance or contact their support team via phone, email or by sending a ticket directly from the web-based platform. SMB and enterprise pricing for Looker BI software solution is available upon request. Pricing information and plan options have not been made available to the public. You may visit the Looker official website and contact them directly for pricing details or to ask for a quote. You may also request for a demo from their website. Looker is a fairly decent self-service BI software solution. It is packed with a variety of robust features and it’s easy to use. The web-based platform comes with strong collaboration tools and functionalities that make it a suitable, if not perfect, data-discovery and exploration solution for medium- to large-sized enterprises. Looker is quite capable of unifying SQL and big data management across the board. However, although its features cater to small businesses and startups with relatively smaller teams, the pricing might be a bit outside the budget range of the majority of smaller organizations. But then again, you’ll never know until you contact the company for a quote. Does Looker offer guides, tutorials and or customer support? Does Looker offer multi-user capability (e.g. teams)? What are some applications Looker is commonly used in tandem with? Does Looker integrate with any other apps? Does Looker offer an API? What platforms does Looker support? What is Looker generally used for? Who are the main user groups of Looker?